Preheat the oven to 450°F. 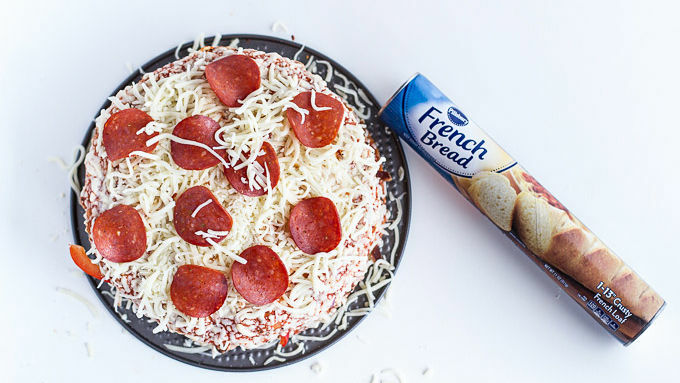 Pre-bake the Totino’s Pizzas for about 10-12 minutes, until almost done. Remove pizzas from oven to cooling racks. Reduce oven temperature to 425°F. Separate the springform pan into two pieces – bottom and side. Grease the bottom and side of an 8 or 9-inch springform pan. Set the side piece aside for now. When the pizzas are done pre-baking, it’s time to start assembling your cake. Layer 1: Place one cheese pizza on the bottom of the spring form pan. Sprinkle the cheddar cheese over the pizza. Toss the chicken with the ranch dressing and place on top of the cheese. Add the crumbled bacon, making sure that everything is in an even layer. Layer 2: Place the second cheese pizza right on top of Layer 1. Sprinkle the pizza with Swiss cheese. Now add the Canadian bacon and pineapple, again making sure that everything is in an even layer. Layer 3: Place the third cheese pizza over Layer 2. Sprinkle with mozzarella cheese. 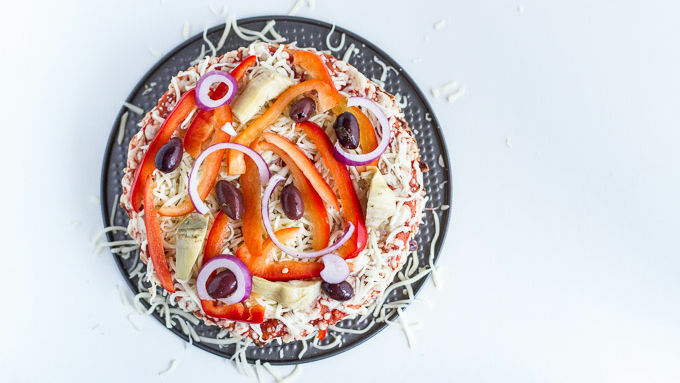 Add the bell pepper, zucchini, red onion, olives, artichoke hearts and sun-dried tomatoes in an even layer. Layer 4: Place the fourth cheese pizza over Layer 3. Sprinkle with mozzarella cheese. Add the cooked sausage, mushrooms, red pepper, red onion and crushed red pepper flakes in an even layer. Layer 5: Place the last cheese pizza over Layer 4. Sprinkle with provolone cheese. Add the pepperoni slices. Carefully unroll the French bread dough. 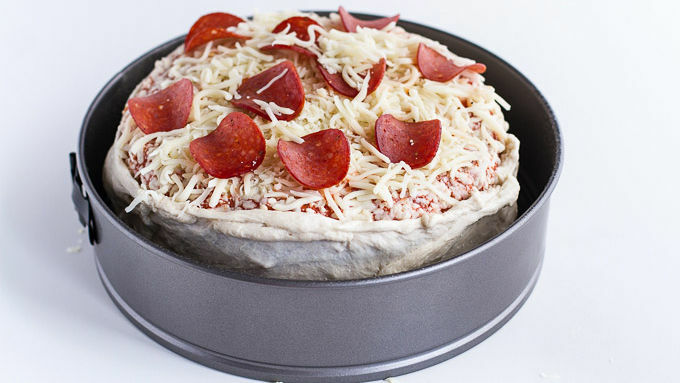 Shape the dough around the outside of the cake, pinching the dough along the edges of the pizza to adhere. Don’t worry if it’s not perfect -- just make sure to attach ends of the dough together so the circle is complete. Place the springform side piece around the outside of the cake. Bake for at 425°F. 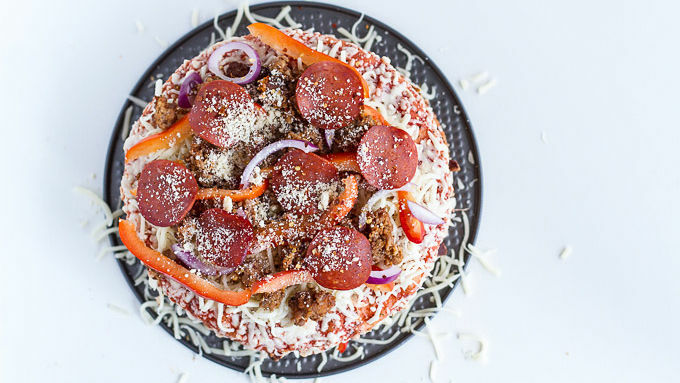 for 25-30 minutes or until the bread around the cake is baked and the top pizza is golden. Allow the cake to cool 5 minutes. Use a very sharp (or electric) knife to cut into the cake. Enjoy! The cake can be assembled in advance and stored in the refrigerator until ready to bake. Just leave the cake on the counter while you preheat the oven and bake as directed. It’s important to try your best to keep the layers flat and even. If one side of your cake is lopsided the cake will tilt to the side and possibly fall. This is not your average cake. 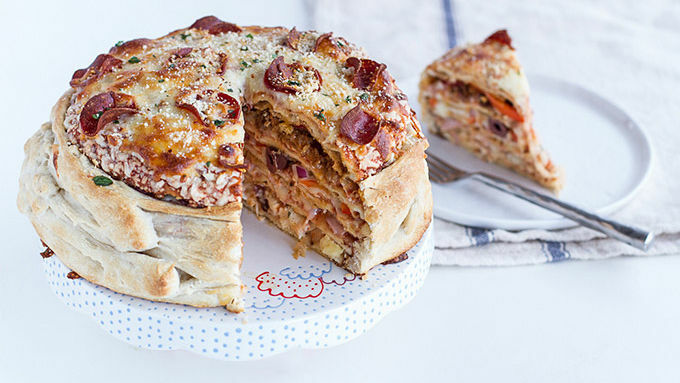 This cake is made of layer upon layer of pizza! I would never trade a good chocolate cake for anything, but give me a chance to make a savory cake and I am all over it. Especially if that said cake involved FIVE layers of PIZZA!!! Yes, yes and yes. 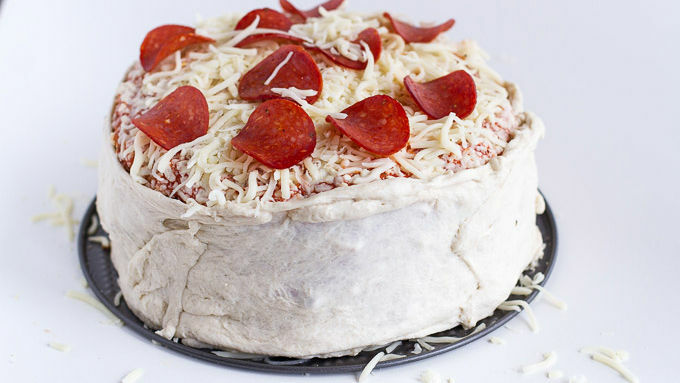 I made a pizza cake with 5 different layers of pizza. 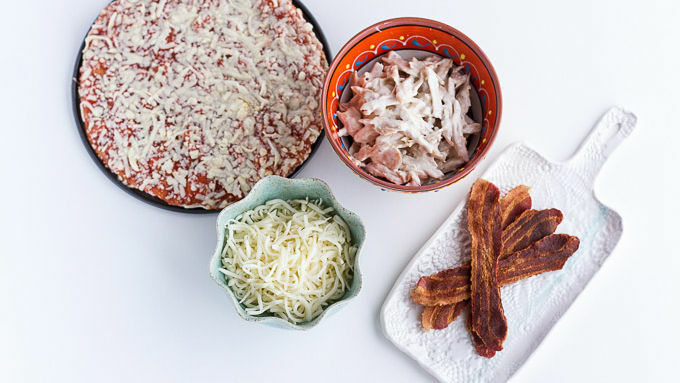 We saw this over on Foodbeast and just had to try it – but with pre-made party pizzas jazzed up with some extra add-ons. It’s fun for entertaining because it can serve a crowd, and well ... people will just be amazed by this. 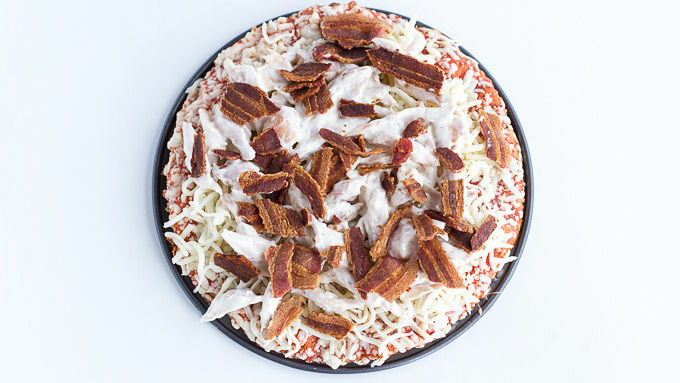 Plus, there is a layer for one and all: chicken and bacon, Canadian bacon and pineapple, veggie, supreme and classic pepperoni. The cake can be assembled in advance and stored in the refrigerator until ready to bake. Just leave the cake on the counter while you preheat the oven and bake as directed. It’s important to try your best to keep the layers flat and even. If one side of your cake is lopsided the cake will tilt to the side and possibly fall. Use a very sharp knife to slice it into wedges and enjoy!